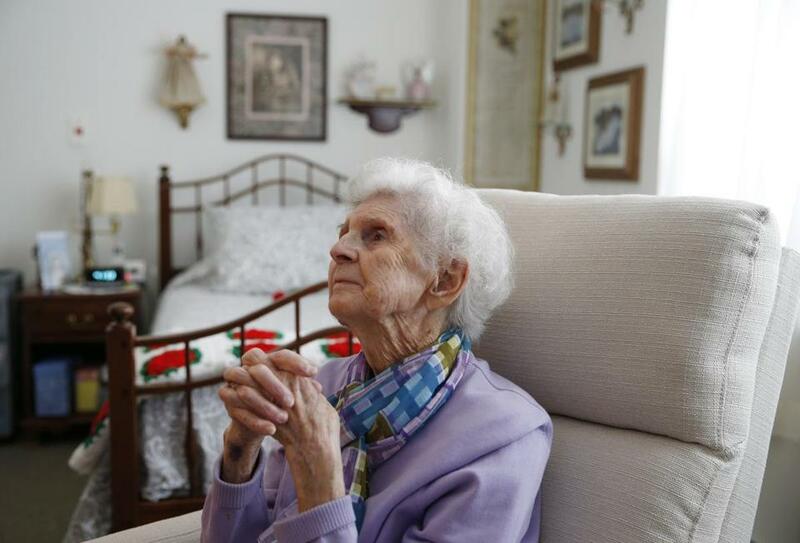 Dottie Creamer, 92, in her apartment at Christopher Heights, an assisted living residence in Marlborough. MARLBOROUGH — As snow melted outside the columned entrance to the Christopher Heights assisted living complex last week, Mary Massauro celebrated her 101st birthday with lobster pot pie, a blue balloon tied to her chair. Residents chatted in the dining room about family and politics. Down the hall, 92-year-old Dottie Creamer was enjoying a visit with her son. Creamer, who had lived alone before moving in last fall, said she felt like “a freight train that was out of control” after she stumbled and fell. “I was so fortunate to come here,” she said. In the future, however, even good fortune might not be enough to help folks like Creamer. Communities such as Christopher Heights, which reserves more than half of its apartments for middle-income tenants, are in short supply. And the price tag is out of reach for many. The oldest baby boomers, born after World War II, will be entering their 80s in the coming decade, swelling demand for independent living, assisted living, and memory care. At the same time, operating costs are rising, while federal subsidies for affordable housing have been frozen. That’s already creating financial strains for the managers of senior housing and for developers, who find it more profitable to build residences geared to wealthier seniors. 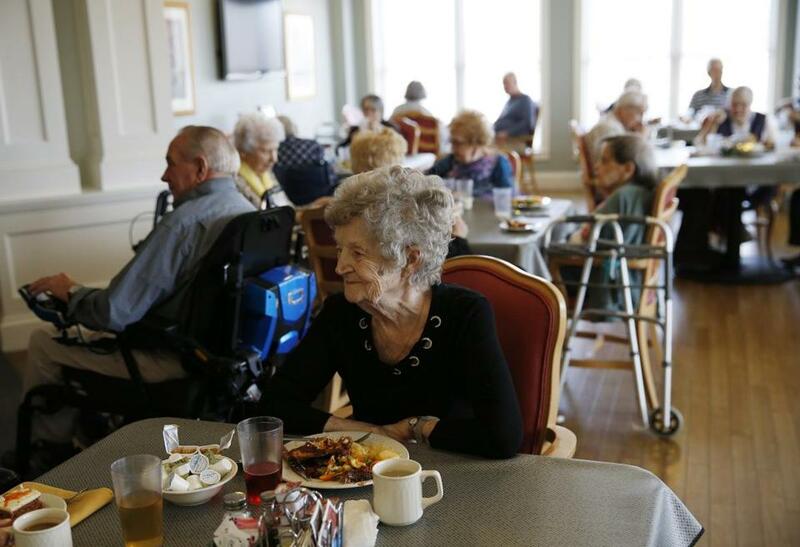 Even as demographers warn of a coming “silver tsunami,” government funding constraints and the volatile economics of housing construction make it difficult to gauge how severe the shortage of senior housing will be over the next 20 years. Senior housing advocates from across the nation are visiting Capitol Hill this week to lobby members of Congress and their policy directors to increase funding for development grants and low-interest loans, as well as subsidies for low-income renters. Dottie Creamer (right) and her son, Steve, (left) visited together at Christopher Heights. One looming question is how many folks will want senior housing. Developers overestimated demand in the 1980s, assuming people would move into senior housing when they were in their 60s or 70s. With medical advances extending life, it’s now clear most prefer to “age in place” in their homes for as long as possible. The majority who enter assisted living or long-term care facilities today do so much later, and only for the last few years of their lives. Others who’d like to move find themselves stuck in homes that are too large and require significant upkeep. A report last year by Harvard University’s Joint Center for Housing Studies said that more than half of the nation’s households are headed by someone at least 50 years old, and many struggle to pay for housing and other necessities. Developers in expensive regions like the urban Northeast and coastal California must grapple with the costs of housing construction and complying with what they complain are often cumbersome state regulations. The economics drive a focus on high-end communities, where private-pay residents pony up monthly rents that can top $10,000. Properties like the Bridges by Epoch, a memory care facility in Westwood catering to people with Alzheimer’s disease and other forms of dementia, provide a comfortable living environment with round-the-clock nursing care, three meals a day, and a roster of activities ranging from music therapy to group outings. But only the most fortunate families can afford the rent, which ranges from $8,000 to $9,000 a month. “We offer a unique lifestyle that isn’t matched everywhere,” said Laurence Gerber, chief executive of Epoch’s parent company, Epoch Senior Living of Waltham. Winnie Glennon ate lunch at Christopher Heights. Residents of market-rate units typically need to draw on substantial nest eggs, sell homes that have soared in value in Eastern Massachusetts, or get financial help from their adult children. The transition can be toughest on older people relocating to high-cost corners of Greater Boston from lower-cost locales to be closer to their children who are working in the area’s red-hot economy. The outlook is far grimmer in the affordable market segment, which relies on the government to underwrite building costs through tax credits to private investors, and to supplement rents for low-income residents, who pay as little as $300 to $350 a month out-of-pocket. A four-year funding freeze in a key affordable housing program administered by the Department of Housing and Urban Development has slowed development nationally — and stretched waiting lists at senior complexes operated by nonprofits and public housing authorities. Massachusetts has stepped in with some rental voucher subsidies, but they haven’t been enough to offset cutbacks in programs by HUD and other federal agencies. Jo-Anne Dwyer, the Rogerson director of housing, recalled approaching the Hong Lok House in Boston’s Chinatown in 2014, when the nonprofit began accepting applications for 42 new units being opened on the site for residents over 55. As she turned onto Essex Street, she saw a long line of applicants wrapping around the building and snaking down the street. 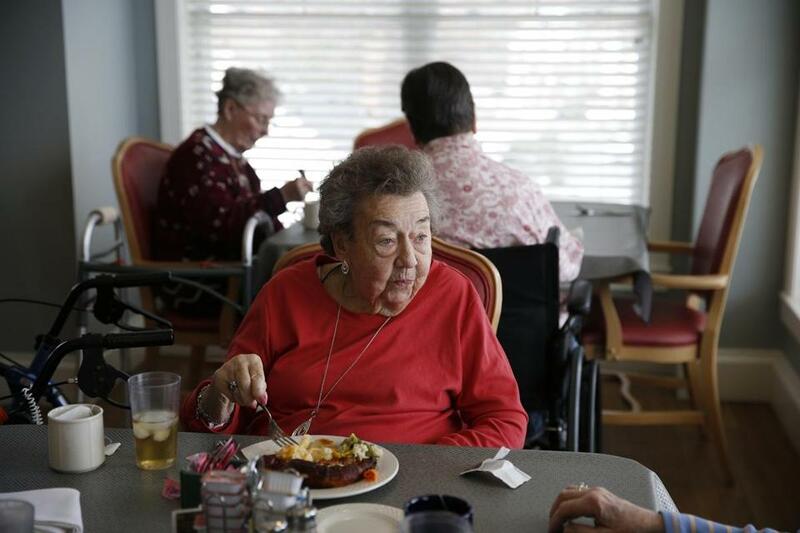 Roberta Rhodes ate lunch with friends and fellow residents at Christopher Heights. 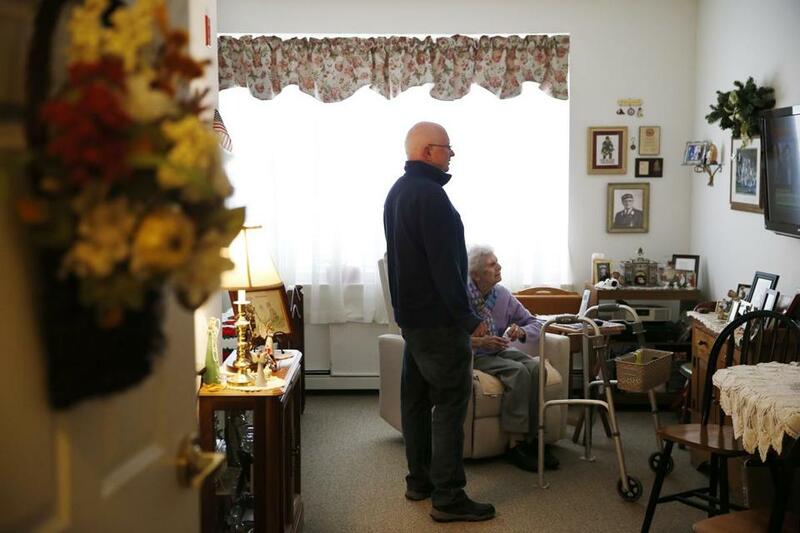 Baker administration officials are grappling with the issues, and a housing work group has made recommendations to the Governor’s Council to Address Aging that would boost financial support for low- and middle-income residents in their homes and in senior housing. There is mounting concern about what Beth Burnham Mace, the Lexington-based chief economist for the nonprofit National Investment Center for Seniors Housing & Care, calls “the forgotten middle.” Mace is preparing a highly anticipated study, scheduled for release this spring, on the housing prospects for middle-income older adults with too much savings to qualify for government support but not enough to afford most of the market-rate options. Senior housing communities like Christopher Heights in Marlborough, and its five sister properties across the state, try to address middle-market needs by designating a share of their apartments as affordable, and by transitioning some tenants from market-rate to affordable rents if they run out of money. Market rents range from $4,200 to $5,700 a month at the Marlborough complex, half the cost of some high-end senior facilities closer to Boston. Creamer moved into an affordable unit here last October from an apartment in Marlborough where climbing stairs was becoming a burden. After her fall, her son Stephen, a retired Boston fire captain, suggested she apply for a room at Christopher Heights and she agreed. 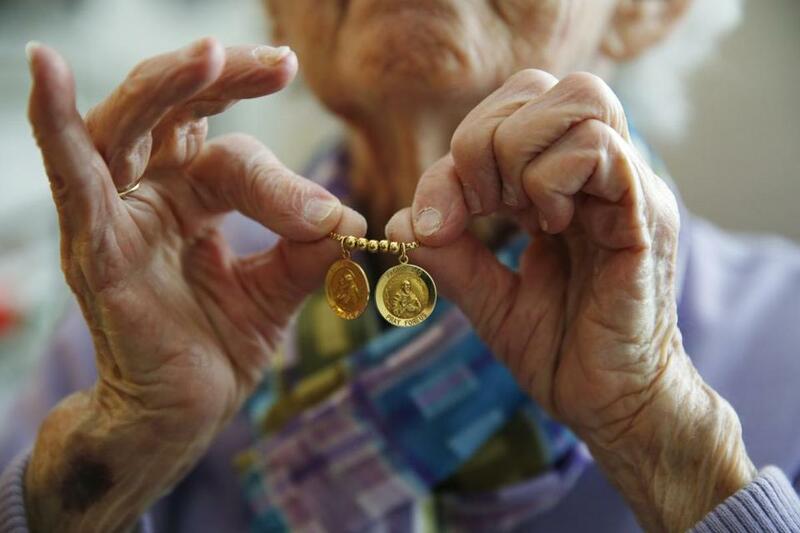 Dottie Creamer, 92, held out her necklace with Saint Anthony and Padre Pio. She picked it up from her old apartment for good luck the day she moved into Christopher Heights. On the day she came in for an interview, Creamer, who is Catholic, wore a necklace dangling with medals of Saint Anthony and Padre Pio for good luck. She soon discovered, to her delight, that a woman who goes to her church and another she knew through work were residents. She found herself among friends.